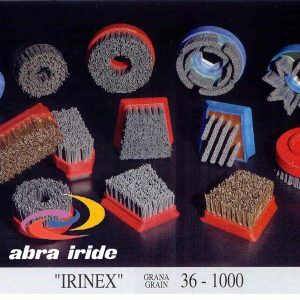 Used for preparing the surface for aging/polishing of marble, granite, and any natural stone, ceramic and agglomerates. Irinex brushes grits from 36-1000 come in Frankfurt, Fickert 140-170, and Round for Edge Polishers (Levigacoste). Specially treated against heat aging and are particularly suited to humid applications. Both manual and automatic machines with one or more heads. Grits: 36, 46, 60, 80, 120, 180, 240, 320, 500, 600, 800, 1000. FRANKFURT Used on automatic and manual machines for the processing of marble, natural stones and agglomerates. Also available in high-resistant steel wire. FICKERT 140-170 Used on automatic and manual machines for the processing of granite or natural stones. Also available in high-resistant steel wire. LEVIGACOSTE – EDGE POLISHERS Used on edge polishing machines both for straight and bull nosing for marble, granite, natural stones and agglomerates processing. Available both in 100 and 130 diameters with snail holders, Terzago and M14.